Susie and I were on our way back from a trip out East and took one of our usual side road excursions into a “Historical Main Street” town. There was plenty to record as far as architectural details go and that’s exactly what we did. 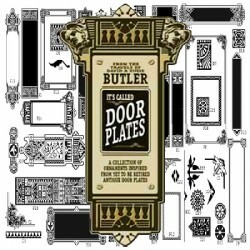 A couple of door plates on main caught my eye and gave inspiration to this Butler Gold Collection. I can’t help but to think back to the time when the artists first sketched these designs out and then some craftsman applied their skills in creating these examples of door hardware that have not only survived the ages but continue to give service after well over a hundred years. I hand digitized these two door plates as accurately as I could and then broke out the different elements and used them to create the contents of this volume. Included in this volume are of course the vectored paths that you more than likely purchased this package for but also included are all of the panels in tiff format that have been colorized with some sample layouts of copy.